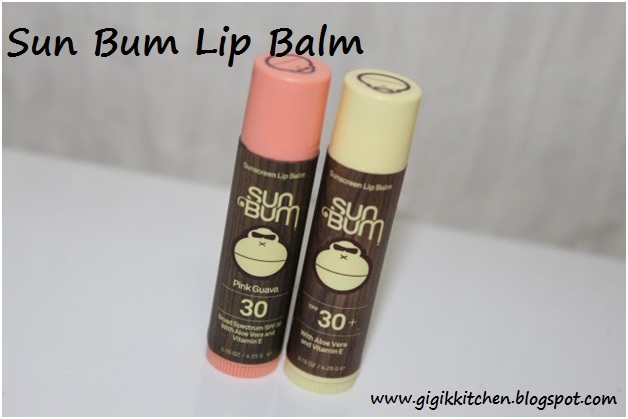 What Sub Bum says about their sunscreen lip balm: " Our smooth SPF 30 sunscreen lip balm with added Aloe and Vitamin E will protect and moisturize your kisser all day long....just try not to lick it off." These lip balms seem to do a good job of hydrating my lips. They are SPF 30 which protects my lips from the sun, this factor is super important to me and it's not often that lip products have any SPF. There's no waxy feeling, these feel very silky and go on very smoothly. They smell just exactly like their scents say. I love the pink guava one, I'm not a big fan of bananas so I don't like that one as much. They taste really good (just like their scents) so if you get a bit in your mouth somehow while your eating or drinking etc. it's not gross. The packaging is really cute! I love the bright colors and little chillin monkies on the caps and tubes. There's a nice amount of product in these tubes. I've been using them for a couple of weeks and haven't even begun to make a dent. I like that there's aloe vera and vitamin e in the ingredients. There's lots of variety in choices available for the flavors- coconut, key lime, mango, pomegranate, pink guava and banana. There is one downside: like many lip balms, they don't last on the lips very long. Have you tried these lip balms? What do you think of them? What are your favorite lip balms? Please recommend them to me in the comments form below- I love trying new things and hearing from my readers!